When a whole culture commits suicide, those holding the gun may imagine a future, but the victims of that “suicide” know better: dead is dead. At an individual level, I don’t know whether suicide is painless, never having tried it myself — and never having spoken to those who were successful in their efforts. I did read recently that even assisted suicide isn’t as painless as its promoters promise, but that’s not actually what this post is about…. 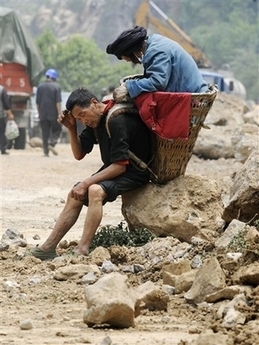 Long ago in China, a boy coming home from school met up with his father, who was carrying on his back a basket holding the boy’s grandfather. Although I was only around 12 when I first read that story, it resonated with me. Aside from admiring the boy’s cleverness, I was so grateful that I didn’t live in a country in which poor people had to make those kinds of choices. I didn’t realize back then that it would take a mere forty years for my country to creep ever closer to justifying the genocide of the old and the sick. Even more ironically, I didn’t realize that this ugly choice would come about, not because individual poor people could no longer afford to care for their elders, but because our own government has decided that the nation as a whole should no longer care for its old people. Old people certainly requiring a lot of care. With every passing year, our bodies become more fragile. While we love seeing videos showing very old people doing amazing physical feats, the reality for most people is that the journey to old age is marked by one bodily system after another breaking down. Our skin’s breakdown is the most immediately demoralizing (“I look so old”), but the real damage from aging happens under our skin, as our joints, muscles, and internal organs just stop working very well. Eventually, every cold has the potential for pneumonia; every fall has the potential to end in a broken hip; every chest pain could be a heart attack; and the joint pains that slowed us down in our 50s can render us immobile by our 70s. Modern medicine, thankfully, can do a lot to ward off some of aging’s worst effects. Putting aside plastic surgery, which heals the spirit not the body, modern medicine offers everything from quick diagnosis and treatment of pneumonia; to hip repairs so effective that the old person can be home in a day or two, rather than confined to a wheelchair or hospital bed for weeks; to an amazing array of heart treatments, whether pills, pacemakers, bypasses, or transplants; and joint fixes that range from pills, to shots, to surgery, to replacement. All of these are the wonders and miracles of the modern age . . . and all of them are very expensive. If you’re a free market person, you think that the way to address the expense is through the market place. If you had your way, you would allow insurance companies to compete nation-wide for customers, without thousands of micromanaging regulations but, instead, subject only to a few reasonable anti-fraud regulations. You would also loosen the FDA’s shackles a bit, recognizing that the perfect is the enemy of the good, and that informed consent goes a long way when allowing experimental treatments on patients with fatal diseases. Doctors too would be relieved of some of the regulatory burdens that bind them, as well as the onerous burdens imposed upon them by insurance companies that are themselves straining under government’s strong hand. However, if you believe that the marketplace is populated by idiots, and that paradise can be achieved only by putting every person’s health and well-being into expert’s hands, you would (1) make a push for single-payer (or “universal” or “socialist”) health care or (2), if you couldn’t go full socialist, you would push for a government-managed marketplace, one that seems to have private providers but, in fact, has the government dictating all aspects of medical insurance and health treatment. In the latter case, you would then tell the public is that this government-controlled market will force insurers and health care providers to lower costs. In either case, you wouldn’t tell the public that, when the government dictates completely how the healthcare market must be run, the available money in the healthcare marketplace shrinks rapidly. In a purely socialist system, the government has no incentive to lower costs, because there’s no competition. And in a government-managed system, as we’re seeing with Obamacare, the regulations are so onerous, and the stifling government control over what should be a dynamic marketplace so incompetent, that prices go up and the system runs out of money. In either case, the provider is then left with only one solution: rationing. My point about rationing is not hypothetical. In every country that has socialized medicine, there’s some form of rationing going on. What European countries have done to hide the rationing is to let people see doctors (because then people think they’re getting medical care), while issuing regulations telling doctors that there are certain treatments that, while do-able and available, cannot be given to people in the wrong demographic. And what’s the wrong demographic? The very old and the very sick. Or in other words, the best treatments cannot be given to the people who need them most but instead, are reserved for those healthy young people who somehow stumble into the wrong disease. Even better, you can avoid treating the young people for the disease too if you argue that the disease’s rarity in their age cohort makes testing wasteful, no matter their risks or their symptoms. When a government-run system runs into a work load too overwhelming to handle, it does something that would result in jail time for any private care provider: it ignores people to death. Just in the last year, we’ve learned about this passive genocide in both England and America. Both the National Health Service and the Veterans Administration simply stopped treating sick people because it was too much effort or because it cost too much to care for them without running over-budget (or, worse, without running the risk of wiping out bonus funds for the bureaucrats). Because taxpayers paying for socialized (or semi-socialized) medicine dislike it when care providers give up the pretense of care and just kill people, governments that control access to medicine are always looking for alternative ways to trim the numbers of sick people that the system neither can nor wants to treat. The trend for the last decade or so has been to abandon active genocide (directly killing patients through maltreatment or no treatment) and to push what I call “passive aggressive genocide” — a health care system tells the patients to kill themselves. The whole “you don’t want to live” push started innocuously enough — and reasonably enough — with those Do Not Resuscitate (“DNR”) directives by which patients tell hospitals that, if they have a sudden death incident while in the hospital, the hospital make only minimal efforts to revive them. The rationale is that, contrary to hospital television shows, most people aren’t miraculously saved by CPR — or at least, most old and sick people aren’t. Additionally, the process of saving someone from sudden cardiac arrest is quite brutal, involving as it does breaking ribs or ripping the chest open to get to the heart. Even worse, if only extreme measures will save someone’s life, there’s a good likelihood that the person will have suffered full or partial brain death or will be so frail overall that the life-saving procedure will stave death off for only hours or days, or will result in the person living as a vegetable. The foregoing are all really good reasons to avoid resuscitation. Especially if one is elderly, it seems infinitely preferable to die peacefully under anesthetic (if something goes wrong), as opposed to having your chest beaten or sliced open, only to die soon after or to linger in a coma. It may have been malpractice that killed Joan Rivers in the first instance but, if her number was really up, it probably would have been easier had she died on the table than lingered, intubated, catheterized, and covered with wires for several days. Or at least that’s what they tell us. Thus, for quite a long time, the medical establishment has told us “Old people, for your own good, if you suddenly die in the hospital, stay dead. It will make you happier in the long run.” And to be honest, I agree with this. For various reasons, I’ve seen or heard of a lot of people in their 80s and 90s who ended up terribly brutalized by CPR and who died anyway. That’s why I have a medical directive. Even good ideas, though, can be the beginning of a slippery slope, especially in a post-moral society. After explaining why it’s so good to die relatively young in a time when lifestyle choices and available medicine mean many of us can live to be quite old, Emanuel hastens to assure readers that he’s not advocating any policy that actually denies medical services to the elderly. He just thinks that old people should all join in with him and aim for dying fairly young. This life force is why my father, on the last day of his life before dying from cancer, when asked by a doctor “What can I do for you,” gripped that doctor by the lapels and, in a fierce whisper, said “Make me better.” And this is why a friend of mine who had AIDS, and who had stockpiled all sorts of medicines so that he could commit suicide when it got too bad, didn’t commit suicide despite Kaposi’s sarcoma, pneumocystis pneumonia, giardia, pedunculated lesions all over his body, and every other indignity AIDS could visit on what was once a healthy, handsome body. Instead, he fought to the end. Contrary to Emanuel’s blithe certainty that, when he’s not as smart and good-looking and active as he is now (ahem), then he’ll just walk away from life with no regrets. I doubt it. But perhaps I’m wrong to doubt that the Emanuel’s of this world are incapable of weakening our will to live. In societies as different as the Bushido warrior culture in WWII Japan and the radical Islamists in today’s world, we see that culture can destroy a human being’s innate life force. Despite our (and every other living creature’s) will to live, we humans can be talked into ignoring that instinct. We can be taught to value death because it serves our society. In Japan, young men who were taught to deny their life force died in kamikaze attacks on Americans; and practically every day, in every place around the world, some young Muslim boy or girl straps a few bombs to himself and goes off to die for Allah. It’s therefore entirely possible that, if Emanuel and his cohorts spend enough time praising premature death, people will start to buy into it. And you know what? I don’t even have to phrase this in terms of a hypothesis. If I just cast my eyes across the Atlantic, I can see the future Emanuel desires. Europe has had socialized medicine since shortly after WWII and has been pushing euthanasia for decades now. WaPo columnist Michael Gerson has been looking at what’s happening in Europe. In today’s opinion piece, he uses the Belgian government’s willingness to grant a serial killer his requested euthanasia as a springboard to discuss Europe’s reverence for medical suicide. Gerson begins by noting that Belgians opposed to the prisoner’s euthanasia request have pointed out that killing a prisoner who is serving a sentence for murder is remarkably like having a death penalty, which the Europeans find barbaric. Pro-euthanasia people dismissed this charge. To them, euthanasia is the ultimate act of individual freedom and self-determination. You have the power to cease being and the government will just make sure your decision gets carried out as painlessly as possible. Put another way: Europeans will gladly kill you if you’re a good person who has harmed no one, but they draw the line at killing a bad person who has murdered others. Kind of makes you think, doesn’t it? Anyway, back to Gerson…. [T]he determination of certain societal classes that are helped in committing suicide is hard to separate from a judgment about the worth of those classes. The right to suicide adheres, in this case, not to all human beings but to sick and apparently flawed human beings. And such a “right” begins to look more and more like an expectation. A mentally or physically ill person can be killed, in the end, because they have an illness. A qualification can slide into a justification. This is a particularly powerful social message since people with cancer or severe depression sometimes feel worthless, or like a burden on their families, anyway. It is pitifully easy to make them — with an offer of help — into instruments of their own execution. And suddenly, there you are . . . right back at the Chinese boy looking at his grandfather in the basket and warning his father that the father’s day will come too. I’ll close with an anecdote I’ve told before because it deserves repeating. Many years ago, when Holland first enacted its euthanasia law, NPR ran an interview with a Dutchman who explained why euthanasia was a good idea in Holland, while it would be a terrible idea in America. The secret to Holland’s euthanasia, he said, was socialized medicine. The man explained that, in America, where medical costs could bankrupt families, those with terminal illnesses could be actively or passively coerced into turning to euthanasia in order to save their family’s finances. Thus, both this Dutch man and the NPR host who interviewed him were both certain that Americans, when given the choice, would cheerfully throw Grandma from the train in order to save some money. Europeans, the Dutchman explained, with their cradle-to-grave care, would never be pressured into killing themselves. The beneficent state would pay all the medical bills, so money would not be an issue when it came to life and death decisions. The only thing that would matter in Europe, said this Dutchman, was the terminally ill person’s wishes. I, being a good liberal back in the day, enthusiastically endorsed what he had to say. Clearly, euthanasia was a dreadful idea in America, where money was God, and people would be tempted to slip arsenic into their dying child’s broth in order to save the college fund for the next kid in line. The intervening years since I heard that radio interview have revealed that the Dutchman was absolutely and completely wrong. In America, people have willingly bankrupted themselves to save beloved family members. Mammon becomes meaningless when an extra treatment might give your child or a young mother a few more days, weeks, or years of life. People have hearts and souls. They connect to others, especially to those in their families. The Golden Gate Bridge is, in my humble opinion, one of the most beautiful sites in the world. Not only is the Bridge lovely in and of itself, driving or walking across it is pure sensory pleasure. Look east, and you see San Francisco and the San Francisco Bay; look west, and you see the Marin Headlands and the vast Pacific Ocean. It’s no wonder that, in addition to the 120,000 vehicles that cross it per day for business and pleasure, thousands of people also walk or bike across the bridge, the better to admire the glorious views. At present, whether one is walking or driving, the views are limited only by the original four foot high barrier — something that does not affect most viewers, whether on foot, on a bike, or in the car. After waffling for years, the Bridge District is finally putting before the public for the latter’s input the five plans it came up with to deter suicides. The proposed barricades will cost approximately $40-50 million dollar. They are are being pushed primarily by people whose loved ones have been amongst those who committed suicide. You can see the proposed plans here. One of the things you’ll notice is that, with a single exception — a net below the railings — the proposed plans all obscure the view if one is on the Bridge, especially if one is driving. Additionally, all of the plans will change the look of the Bridge when seen from afar. So, for $50 million dollars (give or take), people both on and off the Bridge will see their views impaired. My question for you is whether you think it’s appropriate for the public to bear two enormous costs (the financial cost and the destruction of part of the Bridge’s aesthetic values) to prevent further suicides. As for me, while I understand that the Bridge has always been a suicide magnet, and that many suicides are impulsive acts that might not occur if the actor didn’t just happen to be on a suicide magnate, I don’t think that’s enough to make these costly changes. When one considers the hundreds of thousands of people who, on a daily basis, enjoy the beauty the Bridge provides, I don’t believe it’s reasonable to destroy the view for the general public in order to try to save the 15-20 lives lost on an annual basis on the Bridge. When one considers the minute fraction of Bridge users that the suicides represent, and the fact that at least some of those 15-20 annual suicides are not impulse suicides, but will live to try another day and another way, it simply seems unfair to change forever — at great expense — the uniquely beautiful character of San Francisco’s Golden Gate Bridge.